When Thinking Of 500hp Street Cars, 8-Second Door-Slammers, And 6-Second Dragsters, Images Of V-8s Will Likely Come To Mind. So What Are All These VW Bugs Doing Here? 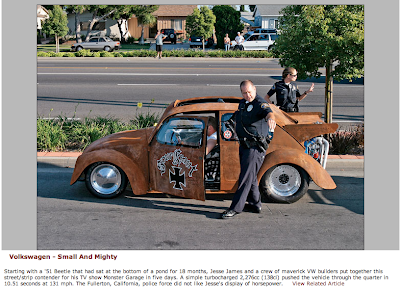 Originally published by Hot Rod magazine. 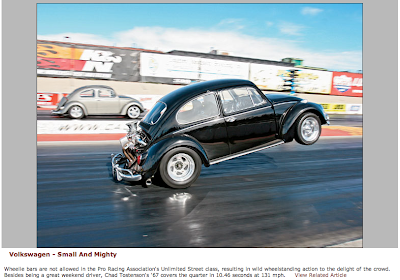 Back in 1965, HOT ROD wrote a piece about the EMPI Inch Pincher, a 13-second '56 Volkswagen sedan that became the terror of the NHRA Gas classes. The article finished with these words: "The next order of business would seem to be a crack at the 100-mph mark and possibly a shot at the 12s. This e.t. projection may seem to be a bit ambitious on our part, but then who would have thought a Volkswagen could win Street Eliminator?" A Bug running under 13 seconds appeared implausible at the time, especially when considering that a then-new '65 model could barely achieve 23 seconds in the quarter-mile. Guess what: VWs are still being drag-raced today, though now they can run faster, much faster, than 12s. To most, drag racing a slow, air-cooled Volkswagen would seem absurd, yet cars such as the EMPI Inch Pincher (which incidentally graced the cover of Rod & Custom in Oct. '66) proved to the crowd that the li'l foreign sedan might be a noteworthy track contestant. Gearheads who typically loved rooting for the underdog soon took a liking to the vehicle. They also enjoyed reading about these improbable hi-po contenders in HOT ROD in the '60s and early '70s. Many wondered how such small and seemingly underpowered automobiles could beat V-8-equipped tin on the NHRA circuit. A few VWs indeed won NHRA national events in the '70s. Weighing as little as 1,100 pounds, the most competitive of this evil-handling bunch ran in the H/Gas and I/Gas Modified Eliminator classes, where they posted elapsed times in the mid 11s to low 12s. Eventually Paul and Mark Schley pulled off the first 10 with their '60 Bug in 1972. Volkswagens then joined the ranks of the Modified Compact originated in 1973, until the NHRA dropped the category in 1984. The fact that the German manufacturer never supported any drag races or their VW contestants likely played a role in this class's demise. 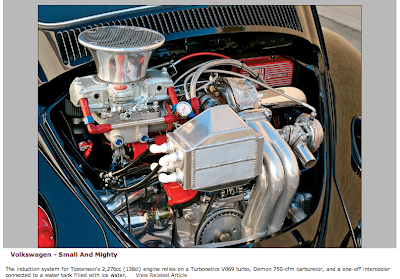 The induction system for Tostenson's 2,276cc (138ci) engine relies on a Turbonetics V069 turbo, Demon 750-cfm carburetor, and a one-off intercooler connected to a water tank filled with ice water. Parallel to the NHRA and IHRA sanctioning bodies, VW dragstrip competitors often participated in Volkswagen-only events. The most famous of them all, named Bug-In, drew gigantic crowds and up to 1,000 competition entries at Orange County International Raceway, California, between 1968 and 1983-the year OCIR closed. Players such as NHRA legend Cory McClenathan used these grounds to win their first battles. 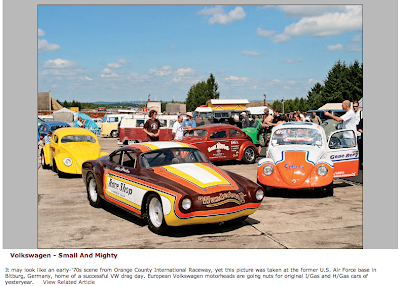 Cory was even the victor of Top Eliminator at Bug-In 26 in 1981 with a '56 Bug, before building an air-cooled, VW-powered Karmann-Ghia Funny Car, a flopper that eventually ran in the 7s. With the NHRA providing fewer opportunities for Volkswagens to race, a few enthusiasts created a new championship named the Pro Racing Association (PRA; see www.lowbugget.com) in 1988, catering solely to VWs based on the West Coast. Other PRA championships have since been created in Texas and on the East Coast (see page 98). Southern California's Bug-Ins have been recently revived, too, and the '05 edition became the largest drag race ever held at California Speedway in Fontana. Air-cooled VWs can easily turn into efficient dragstrip contenders, due in part to their light weight (1,760 pounds for the popular '67 Beetle) and rear engine configuration. This translates into impressive 60-foot times and easy wheelies with limited modifications -and the crowd loves it. When interviewed for National Dragster in 2000, Bill Mitchell (the first H/Gas racer in the 10s on the East Coast with a VW in 1972) stated: "We didn't have 60-foot clocks back then, but I'd be willing to bet that my Bug ran as hard in the first 60 feet as the 7-second (V-8) dragster that I'm driving now." In the '50s, some engine builders found ways to extract great horsepower numbers from the small air-cooled flat four, which proved both sturdy and lightweight; the crankcase is made of magnesium. Soon these powerplants became a common sight on cars competing in a variety of motorsports including off-road, sand sports, and Midgets. Dean Lowry, who was influential in the development of the EMPI Inch Pincher, also found ways to adapt a pair of huge Weber 48IDA carbs in 1965, shortly after they appeared on Carroll Shelby's mighty Cobras. Thousands followed Lowry's example. Over four decades later, some PRA classes still welcome carburetors, but bored up to 62 mm as in Super Street, a category open to VWs with stock floorpans; the record stands at 10.19 at 131 mph. A typical Super Street engine would be based around a late-model Bug crankcase (1,600 cc) or aftermarket equivalent, displaced in the neighborhood of 2,400 cc (147 ci), and featuring a compression ratio of 15.0:1. They may also use aftermarket heads from companies such as Auto-Craft, with 50- and 38mm valves (respectively 1.97 inches and 1.49 inches). A few PRA classes are based on indexes, including Super Modified (12.90), Super Gas (11.90) and Super Comp (10.90), but at the other end of the spectrum is the quickest heads-up class, Pro Mod. Regulations allow tube chassis, aftermarket crankcases, turbochargers or nitrous, and fuel injection. Eric Madson holds the Pro Mod record with a blistering 8.67 at 161 mph, driving a turbocharged '67 Karmann-Ghia. Its engine displaces a mere 2,414 cc, or 147 ci. Induction relies on a 211/42-inch Hilborn throttle body, while the air travels through a massive Innovative GT-61/TO4 ball-bearing turbocharger and an aluminum intercooler filled with ice water. The minimum weights in Pro Mod and Super Street range between 1,400 and 1,600 pounds. Since the infancy of VW drag racing, gearboxes have proved the weak link. Early cures involved Porsche 356 transaxles, but the aftermarket has come to the rescue with beefed-up units, all manual, more often than not built by Auto-Craft and Mendeola. Bugs remain the main air-cooled VW model being raced. However, a handful of competitors participate with Volkswagen Buses. Don't laugh; the fastest was turbo-guru Dave Kawell's '60 workhorse, which posted a best of 10.24 at 128 mph. Kawell later battled with a '63 VW Squareback, with a front-mounted Volkswagen flat-four bolted to a Jerico clutchless gearbox. It proved good enough for 8.63 e.t. 's at 160 mph. Other odd turbo Volkswagens running quick times include Doug Harvey's 2,387cc/145ci '67 Fastback (8.63 at 164 mph), and Ron Lummus' '02 New Beetle (8.42 at 173 mph) . . . with a 2,711cc/165ci, air-cooled VW motor fitted in the back of its tube chassis. Since the '60s, a number of rails have run air-cooled Volkswagen engines as well. Dave Kawell had already posted the first sub-8-second pass (7.96 to be precise) in 1983, and performances have improved tremendously since then. The turbocharged digger campaigned by the VW Paradise team (San Marcos, California) currently holds the world record, thanks to a 6.53/209-mph pass. As far as we know, this is the fastest four-cylinder dragster in the world. Now keep in mind that most stock Beetle engines make between 30 and 50 hp, while the VW Paradise beast delivers 1,300 hp from a flat-four (with aftermarket case) that displaces 2,854 cc or 174 ci. That's 7.5 hp/ci from a four-cylinder, whose basic design harks back to the 1930s. During the early '70s, a state-of-the-art Volkswagen drag engine made about 180 hp at 7,500 rpm. Thirty-five years and plenty of high-performance R&D later, enthusiasts can assemble reliable, naturally aspirated motors with off-the-shelf parts and make over 200 hp . . . for their street Bugs. An archetypal combination would look something like this: 2.3L displacement (about 140 ci), reworked OEM or aftermarket dual-port heads, 44x37.5mm valves, and Weber 48IDA carbs. Such engines often reside in simple and tasteful sleepers (known as "California Look" VWs in the Volkswagen scene), featuring a heavy hot rod rake enhanced by big and little tires. Some clubs cater solely to these cars, with the most famous being Der Kleiner Panzers-loosely translated from German as "the little tanks" (see www .dkpcarclub.com). Created in '65, it gathers street-driven and naturally aspirated Volks-wagens that cover the quarter-mile in the 12- and 13-second brackets, with a handful of 11-second rides thrown in for good measure. All vehicles are finished to the highest level, with a few running on lightweight BRM magnesium rims built in the '60s. The rims now fetch as much as 8,000 a set. Turbo cars have gained in popularity during recent years as well. Bolt a turbocharger to the above-mentioned 2.3 liters, and 300-350 hp can easily be achieved. A drag class named Unlimited Street welcomes some of these VWs, which need to cover 20 to 40 miles before hitting the track. The quickest of the bunch, Kris Lauffer, ran a best of 9.33 at 150 mph behind the wheel of his '66 convertible Bug. He accomplished the feat with a 2,442cc (149ci) turbo/nitrous VW motor delivering 633 hp at the wheels. That's a horsepower-to-cubic-inch ratio of 4.25-imagine a 1,682hp, 396ci Chevy V-8 and you'll get the idea. While air-cooled Volkswagens are obviously less abundant now than during the '70s, the hobby remains strong today thanks in part to Hot VWs magazine, which celebrated its 40th anniversary last February. These cars' versatility makes them great contenders for Dare to Be Different projects. Some hot rodders have even found that removing the fenders, installing a straight axle, and chopping the top can soon morph the unassuming German sedan into a tough-looking old-style hot rod. This treatment seems fitting indeed, considering that Ferdinand Porsche created the car in the '30s. With early American tin becoming scarcer by the day, why not consider the idea of wrenching on a VW? They can still be found easily and remain inexpensive. 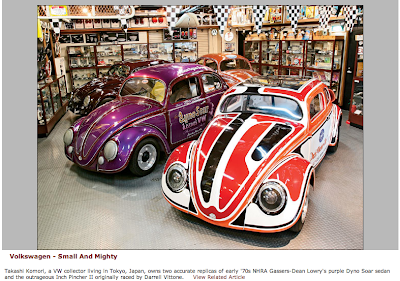 Sanctioning Bodies And EventsThe Nostalgia section of the Web site www.cal-look.com will tell you more about the early days of VW drag racing. Today, three PRA (Pro Racing Association) VW championships cater to vintage Volkswagen aficionados. Log on to www.racepra.com (West Coast), www.eastcoastpra.com (East Coast), and www.txpra.com (Texas) for further information. You may also find these feisty German cars at Sport Compact affairs. A few of the latter host a Pro Stock VW class, with the quickest competitors posting 9.60 ETs. One of the largest Volkswagen drag races remains the Spring Bugorama, an event created in 1978 and held in Sacramento, California. The most popular gathering of air-cooled VWs, including a bunch of hi-po models, takes places in Southern California in June during the VW Classic Weekend. More info about both happenings can be found at www.bugorama.com, other events at www.bugin.com.